This was the first in a series of commercial buildings erected in the City for London-based publisher Thomas Dixon Galpin, partner in the firm of Cassell, Petter and Galpin, the largest publishing house in England at the time. The ground floor contained Pennock & Clayton Jewellers from 1890-1895 and Challoner & Mitchell from 1895-1914. The second floor was home of the Alexandra Club from 1900 to 1911. In 1912, the owner of the adjacent Brown Jug Saloon took over this building known then as the Albion Hotel to comply with the new liquor act and named the complex the Brown Jug Hotel. In 1907, the tenants were John R. Mackie – engraver and Challoner and Mitchell – jewellers, with the Alexandra Club upstairs. 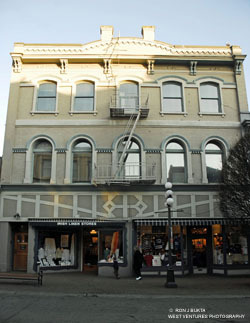 One long-time tenant is the Irish Linen Store, first established in Victoria in 1910 by Scotsman John Norrie. The store moved around downtown until moving here in 1917. It has been here ever since. In 2009, the other half of the main floor is occupied by Jock and Jill, a sports clothing outlet, with government offices upstairs.